There are many investors who have heeded the advice of Jason Hartman, and are looking to diversify their investment positions out of the stock market. However, many of these people have a large percentage of their investment assets tied-up in a company 401k that has limited investment choices. What can a person do that is being held captive to a limited menu of investment options in the current environment? In this situation, the optimal strategy is to capture market returns, while minimizing the costs associated with acquiring those returns. Fund managers have a tendency to charge hefty fees for their services, and frequently under-perform their comparable market indexes. The reason for this is not difficult to reason out. When the gains and losses of all the market players are added together, they average out to the market rate of return. This simple arithmetic dictates that if one manager over-performs the market, that he must be offset by another that under-performs the market. Furthermore, fund managers must overcome the hefty fees that they charge in order to beat the market return. The net result is a zero-sum game created by everybody chasing the same market returns that turns into a negative-sum game when costs are factored-in. So how does a 401k investor get out of this fund manager prison of high costs and disappointing returns? This answer to this dilemma is achieved through the use of Index Funds in a stock portfolio. By capturing the average market returns at a minimal cost, index funds allow investors to ignore the ‘noise’ of daily stock market volatility and focus on the fundamentals. For investors who are looking for further diversification without losing the advantages of indexing, they can choose market indexes for small or medium sized companies that tend to be more volatile and produce higher returns. Similarly, index fund investors can choose international indexes that produce favorable returns and reduce portfolio volatility. In addition to this, there is another option available to “jailbreak” some of your money out of the 401k, and that option is to take a loan against your retirement plan. This strategy is typically advised against, because most people use the loan from their 401k to purchase items like cars or boats that decline in value. However, if you are astute and aggressive there may be an opportunity to use your 401k as a vehicle to acquire capital for investment in other assets like rental real estate. It is no secret that prudent investors should seek to limit their exposure to the stock market. 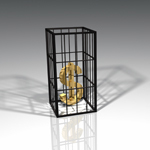 However, for investors that are in “401k Jail” with their employers, there is a viable way to structure your stock market investments in such a way that the major pitfalls of traditional stock investing are mitigated. And for those who are more adventurous, most 401k plans allow the owners to take a loan against the plan balance for outside investment. By thinking creatively, prudent investors can mitigate the impact of ‘401k Jail’ and use this tool to help build long-term wealth.